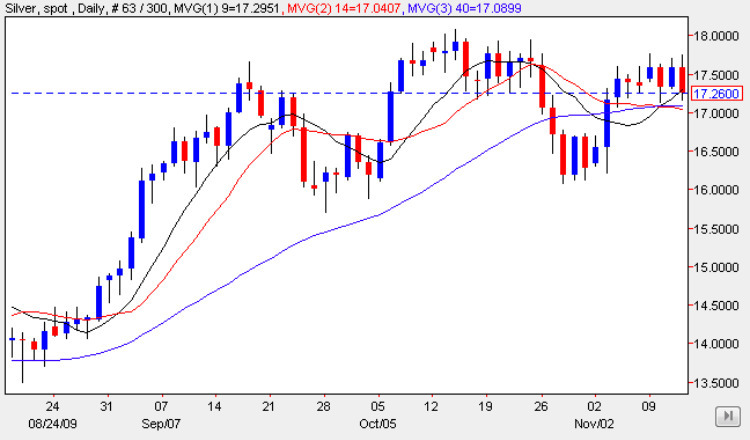 Spot price silver continued to find it hard going battling through the current price congestion, and ended the silver trading session marginally lower, with a relatively narrow spread down candle which found some support from the bunched moving averages once again. Technically of-course the issues on the daily silver chart is the potential resistance now building firmly in the $18 per ounce level and above which is becoming increasingly developed as the days pass, a worrying signal for silver bulls, with yesterday’s price action simply highlighting this issue once again. Whilst we have strong potential support we also have the resistance levels above, and as I have suggested many times in previous silver market commentaries, until this is resolved with a break out above or below these current levels, then the pattern for spot silver will remain sideways for the time being. With spot gold prices now having taken a breather with a minor pullback yesterday, we could well see this reinforced further today as gold traders bank profits and square positions ahead of the weekend, so for spot silver we could see a further move lower in the short term. However for the longer term we need to wait for a breach of the upper or lower levels of the current trend channel which will then set the tone for silver prices longer term.